Whyblocked reminds you why you blocked someone. 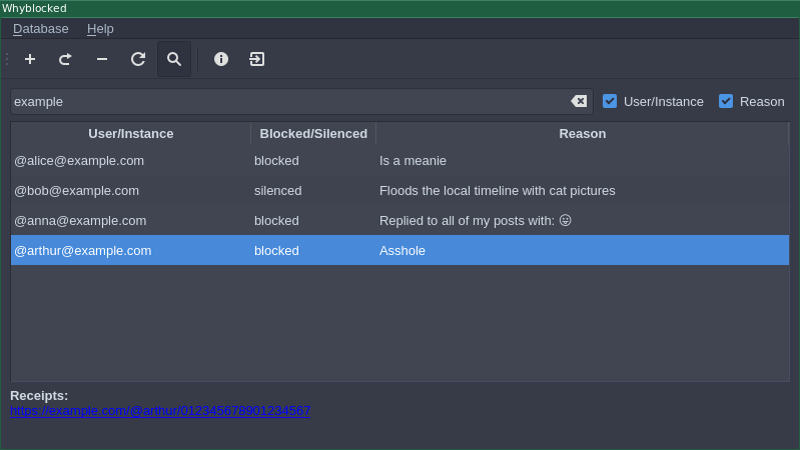 Whyblocked allows you to store the reason why you blocked someone, along with “receipts”, URLs to the posts that led you to block them. It has a Qt-interface and uses an SQLite-database. Run whyblocked. You can also start it from the menu of your desktop environment. Every release includes a .deb-package, an .rpm-package and a .tar.gz-package with precompiled binaries for x86_64(amd64) (more info). These are automatically built and not tested. You can install them with dpkg -i or rpm -i, respectively. The packages are signed with the PGP key 242E5AC4DA587BF9 (Fingerprint: F730 1ADF C9ED 2624 48C4 2B64 242E 5AC4 DA58 7BF9). Gentoo ebuilds are available via my repository. Download the current release and copy xdgcfg into xdgcfg/. If you clone from git, be sure to git submodule init and git submodule update afterwards. See the submodules article in the git book for further info. Contributions are always welcome. You can submit them as pull requests or via email to tastytea@tastytea.de. To start a new translation, go to translations/ and copy whyblocked_en.ts to a file appropriate for the new language. If you want to translate to french for example, that file name would be whyblocked_fr.ts. Use Linguist to edit the .ts-files. Please report them on the issue tracker or to tastytea@tastytea.de. Copyright © 2018 tastytea <tastytea@tastytea.de>. License GPLv3: GNU GPL version 3 <https://www.gnu.org/licenses/gpl-3.0.html>. and you are welcome to redistribute it under certain conditions. The icon is derived from the icons messagebox critical and help of the Gartoon icon theme. The original authors were Zeus, Patrick Yavitz and La Mula Francis, who released them under the terms of the GPL2+ and DSL. The new icon is released under the same terms.